Anne Marinier and Guy Sauvageau at their research laboratory, University of Montreal. 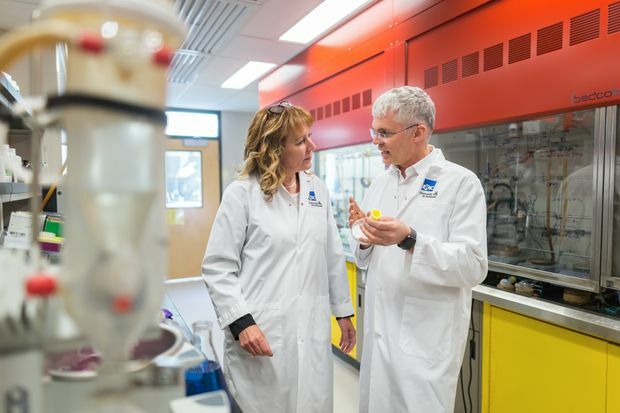 Dr. Mariner and Dr. Sauvageau discovered the molecule that has led to new technology used in treating cancer patients.Courtesy of Globe & Mail. Exciting news from Montreal based company ExCellThera this week. ExCellThera announced the treatment of the final patient in the initial phase of their clinical trial investigating expanded cord blood for the treatment of severe forms of blood cancer including leukaemia. The phase I/II trial demonstrated that the use of expanded Cord Blood is both safe and feasible for treatment of patients in this group. Patients will be followed for three years and researchers are encouraged by the promising early results suggesting that expanded cord blood stem cells may accelerate recovery and improve survival rates compared to conventional cord transplants. Why expand cord blood stem cells? Umbilical cord blood stem cells are often favoured for transplants as they can be more easily matched to patients than bone marrow or peripheral blood stem cells and have demonstrated improved outcomes. The challenge is that there might not be enough stem cells in a single cord blood unit to cater to all treatment indications. ExCellThera’s expansion technology increases the number of stem cells in a single unit of cord blood by 35 times. By expanding the number of stem cells from a cord blood unit, larger children and adults may be able to access cord blood treatments (and trials) that were once limited by cell numbers, including increased and multiple dosing regimens. As the industry leader, Cell Care is committed to educating our valued clients about scientific advancements relating to umbilical cord blood and tissue stem cells. Place your family at the forefront of medical science by storing your child's cord blood and tissue with Cell Care. View the official news release for this announcement here.